Bummer…was a beloved family cat. 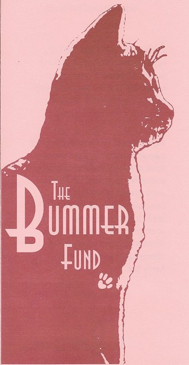 The Bummer Fund was created by his companion in 1994 to honor Bummer’s memory, and in deep appreciation for the compassionate care Bummer received. The Bummer Fund provides financial support to responsible pet owners in times of temporary medical crisis or emergency for a pet. The fund is administered by the Board of Directors. Grants are provided by application or veterinarian referral when catastrophic medical costs threaten to stand in the way of appropriate treatment for a beloved family pet. Come see us at Polish Day 2016!